If you have been thinking of upgrading your older Xbox One console you might be interested in the new Xbox One S Minecraft Favourites Bundle which is now available priced at $299 and offers a 500GB Xbox One S console together with a few other Minecraft goodies. The Xbox One S Minecraft Favorites Bundle (500GB), features everything you need to build, create, and explore. Get full game downloads of Minecraft for Xbox One and Windows 10, plus 13 fabulous, community-favorite content packs, including Halo Mash-up and Festive Mash-up. Craft new Minecraft worlds together with friends on Xbox Live, the best community of gamers around the world. Play over 100 console exclusives and a growing library of Xbox 360 games on the newly designed Xbox One S, the only console with 4K Ultra HD Blu-ray, 4K video streaming, and HDR. Stream your favorite movies and shows in stunning 4K Ultra HD. Then play blockbusters like Gears of War 4 and Battlefield 1 with friends on Xbox Live, the fastest, most reliable gaming network. Play the best console exclusives like Gears of War 4, Halo Wars 2, and ReCore. Plus, all the biggest blockbusters this year like FIFA 17, Battlefield 1, and Titanfall 2. And thanks to backward compatibility, enjoy a growing library of Xbox 360 games playable on Xbox One. Also, the only console where you can play new EA games for a limited time before they’re released with EA Access. 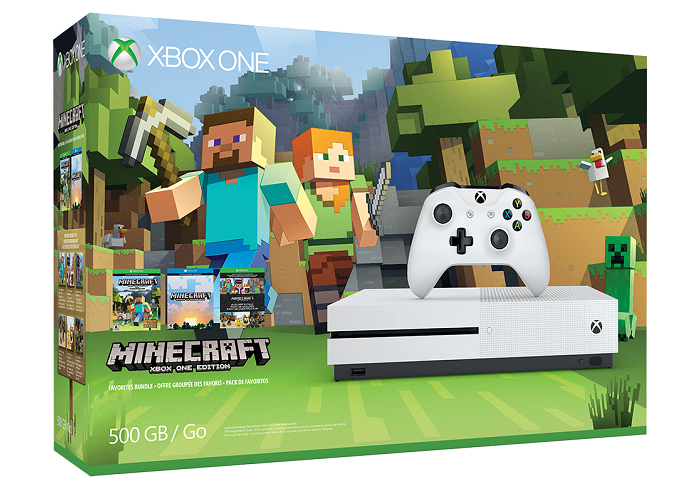 For more information on the new Xbox One S Minecraft Favourites Bundle jump over to the Microsoft website for details by following the link below.